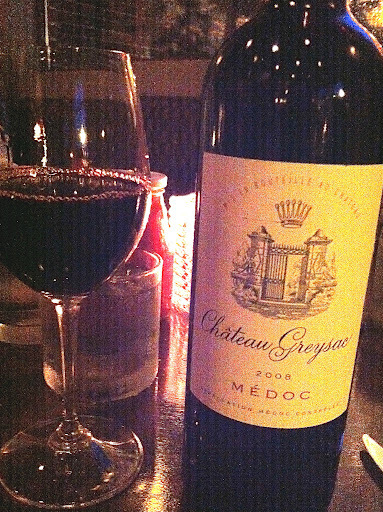 After enjoying Potel Nuits-Saint-Georges 1er Cru Aux Chaignots Pinot Noir, I decided to continue on with sociable, easy drinking French bottles; to accompany dinner I selected Château Greysac Médoc Bordeaux 2008 from the dp Brassiere wine menu. Château Greysac has earned a reputation for making classic Bordeaux wines that are not only affordable, but also an expression of the delicate, elegant and complex characteristics found in the Médoc Cru Bourgeois. Dark garnet with cranberry highlights in colour, aromas of juicy raisins and cherries rose from my glass. Jammy fruit flavours of blackberry and plum converged with sweet fig and hints of herbaceous mint in the light to medium body. Spicy white pepper and toasty cedar elements lingered in the moderate finish. Silky smooth and fruity, this is a snappy, friendly glass fantastic on its own or with a meal. Agreed, fantastic wine and a great value.Slainte!